We are constantly asking people to step up and volunteer, each event takes so many hours of so many people to coordinate. Instead of us just saying why we need you to volunteer, we want to let volunteers and runners tell you how important these roles are, why it’s rewarding and how you can help. Learn more about HMF’s volunteer program here, but let the story below inspire you a little too. My favorite volunteer position is being a course monitor. As a runner, I can vividly remember certain course monitors that encouraged me to keep going when I had nothing left or the ones that were so energetic and motivating that made me smile. They have stayed in my memory bank forever – sort of like my favorite 1st grade teacher. When I am volunteering, my #1 goal is to make sure people are safe. 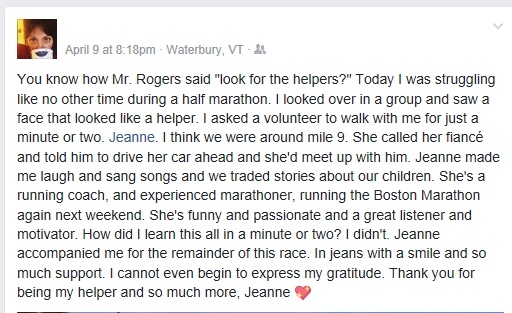 My #2 goal is to be able to encourage and motivate runners and give someone a memory that they can cherish forever. A “feel good” memory that they can look back and smile. Building positive lifelong memories is what running is all about to me. 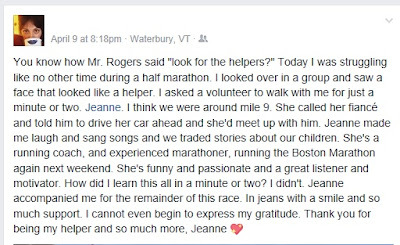 When I was the course monitor for the Harvard Pilgrim Middletown Half this month, I was fortunate enough to be able to help a woman when she was struggling to keep going. She was one of the last runners so I was able to leave my course monitor location and reach out to her. 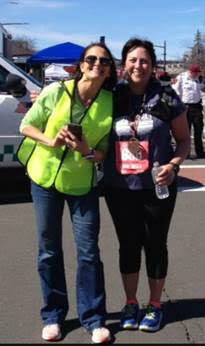 We walked, we laughed, we talked, we ran a little and she crossed that finish line and got her medal. We also hugged after and I made a friend for life. I hope that I helped contribute a lifelong memory so she’ll continue to run because at the end of the day, she had a good experience. This time of year in the Northeast, everyday is a surprise when it comes to weather. Runners have to shift between winter and spring apparel and break out rain gear in the blink of an eye. Our friends at soundRUNNER in Glastonbury have some important all-weather tips that many of us aren't thinking about until summer - eye protection. One thing that many people forget about this time of year is the importance of eye protection. While we're still gaining hours of daylight, when you manage to get out before the sun is gone for the day, your eyes can actually take more damage than during your average summer time run. This surprising fact is due to the extra water glistening on the roads that seem to perpetually be flowing. That is why it's important to always have sunglasses at the ready during all seasons. On top of being sure to wear sunglasses, Polarized options are especially helpful when you have excessive light coming at you from multiple angles, as shown below. The downside of Polarized is that these types of lenses do poorly with depth perception, making them slightly worse for trails or places with treacherous terrain. Some companies, like Tifosi, make options with interchangeable lenses or different levels of light transmission to try to help accommodate any situation you could find yourself in. They even have lenses that automatically adjust to how bright it is out. Take care of your eyes at all times of the year. Even through winter it is very important to have eye wear in mind!